Thin, red veins of energized gas mark the location of one of the larger supernova remnants in the Milky Way galaxy in this image from NASA’s Spitzer Space Telescope. A supernova “remnant” refers to the collective, leftover signs of an exploded star, or supernova. The red filaments in this image belong to a supernova remnant known as HBH 3 that was first observed in 1966 using radio telescopes. Traces of the remnant also radiate optical light. The branches of glowing material are most likely molecular gas that was pummeled by a shockwave generated by the supernova. The energy from the explosion energized the molecules and caused them to radiate infrared light. The white, cloud-like formation also visible in the image is part of a complex of star-forming regions, simply named W3, W4 and W5. However, those regions extend far beyond the edge of this image. Both the white star-forming regions and the red filaments are approximately 6,400 light years away and lie inside our Milky Way galaxy. HBH 3 is about 150 light-years in diameter, ranking it amongst the largest known supernova remnants. It is also possibly one of the oldest: Astronomers estimate the original explosion may have happened anywhere from 80,000 to one million years ago. In 2016, NASA’s Fermi Gamma-Ray Telescope detected very high-energy light — called gamma rays — coming from the region near HBH 3. 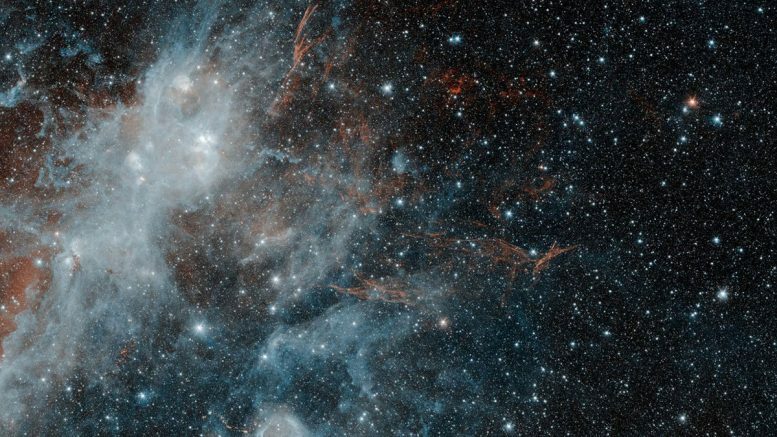 This emission may be coming from gas in one of the neighboring star-forming regions, excited by powerful particles emitted by the supernova blast. The Spitzer Space Telescope is one of NASA’s four Great Observatories — along with the Hubble Space Telescope, the Chandra X-ray Observatory and the Compton Gamma-Ray Observatory — and will celebrate its 15th birthday in space on Aug. 25. Spitzer sees the universe in infrared light, which is slightly less energetic than the optical light we can see with our eyes. In this image, taken in March 2010, infrared wavelengths of 3.6 microns have been mapped to blue, and 4.5 microns to red. The white color of the star-forming region is a combination of both wavelengths, while the HBH3 filaments radiate only at the longer 4.5-micron wavelength. JPL manages the Spitzer Space Telescope mission for NASA’s Science Mission Directorate, Washington. Science operations are conducted at the Spitzer Science Center at Caltech in Pasadena, California. Spacecraft operations are based at Lockheed Martin Space Systems, Littleton, Colorado. Data are archived at the Infrared Science Archive housed at IPAC at Caltech. Caltech manages JPL for NASA. Be the first to comment on "Supernova Remnant HBH 3 -The Fading Ghost of a Long-Dead Star"